The original intention was for Aunty and I to climb up to the top of Tryfan, but the ‘Best laid plans of mice and a Welshman’ do not always come to pass. Aunty had expressed a desire to walk up Tryfan. I have to admit this was a surprise, as she prefers flatter walks, but who am I to deny her the experience. I’ve been up Tryfan a couple of times and although it’s not very high from the starting point at Llyn Ogwen, it is still a challenging scramble to the summit. But once on the top the views are great. Tryfan just before the cloud descended, scuppering our plans. As we walked up the steep slope from Llyn Ogwen across the boggy areas the cloud started to descend over Tryfan and Glyder Fach and Glyder Fawr. I hoped this would lift, but as we topped the first ridge onto Llyn Bochlwyd, the cloud thickened and the peaks disappeared into grey, unwelcoming nothingness, indistinguishable from the sky. I’m old enough now to ask it is worth climbing up there and see nothing. And the answer is usually no. Aunty didn’t fancy it either, so we decided on another plan, and walked around the base of Glyder Fawr and then down to Llyn Idwal. Today was not a day for summits, but more for moody lakes and a surprising amount of wild flowers. The area was covered in Bog Asphodel, the yellow flowers lighting up an otherwise drab landscape. Tryfan is part of the Glyderau mountain range which lies to the northeast of the Snowdon massif, separated from that mountain by the Llanberis Pass and the Nant Peris Valley. Going from west to east, the Glyderau range consists of Elidir Fawr (924 m (3,031 ft)), Y Garn (947 m (3,107 ft)), Glyder Fawr (1,001 m (3,284 ft)), Glyder Fach (994 m (3,261 ft)) and Tryfan (918 m (3,012 ft)). Looking down onto Llyn Idwal. The slopes are steep in places, which Aunty pointed out a couple of times. The Glyderau range was formed about five hundred million years ago, when two land masses collided, causing the Snowdonia massif to rise up. Since then, wind, water and frost and the advance and retreat of glaciers during the ice ages have gradually worn down the mountains to their present proportions. The underlying rock is a mixture of volcanic and sedimentary material. The ice sheet of the most recent ice age retreated about ten thousand years ago leaving Cwm Idwal as an example of a cirque. The ice scarred the surrounding cliffs, hollowed out the bed of Llyn Idwal and dumped rocks and other material that formed moraines at its foot. Massive boulders and shattered rocks crashed down from above to form the boulder fields and screes visible today. 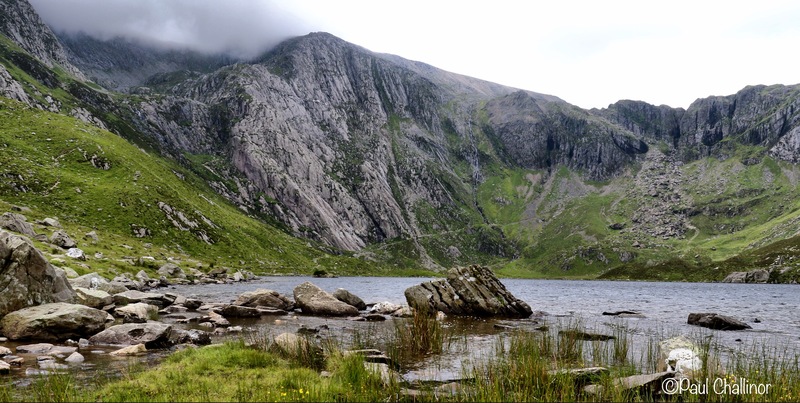 Llyn Idwal, looking up at Glyder Fawr and the Devil’s Kitchen. Even though this is tough country the wildlife abounds, and can be found in surprising places at times. As we were puffing our way up the path towards Llyn Bochlwyd I noticed a small white flower on the side of the path. This was new to me, the delicacy of the white flower and yellow spot on each petal enthralled me for a while. The Starry Saxifrage flowers from June to August and is found on higher ground in North Wales, Cumbria and Scotland. Starry Saxifrage, Saxifragia stellaris. Small, deliacte and perfectly formed. In the wetter areas Cotton Grass grows in profusion, and from a distance looks like hundreds of white flags swaying gently in the breeze. Up close the delicate nature of the cotton seeds is amazing. Common Cotton Grass, Eriophorum angustifolium. Next time you it look closer. On the slopes above Llyn Idwal insect life was also busy, but because the temperature was low the activity was all in slow motion. So much so that this Garden Bumblebee posed for its photograph for long enough for me to get a reasonable photo. 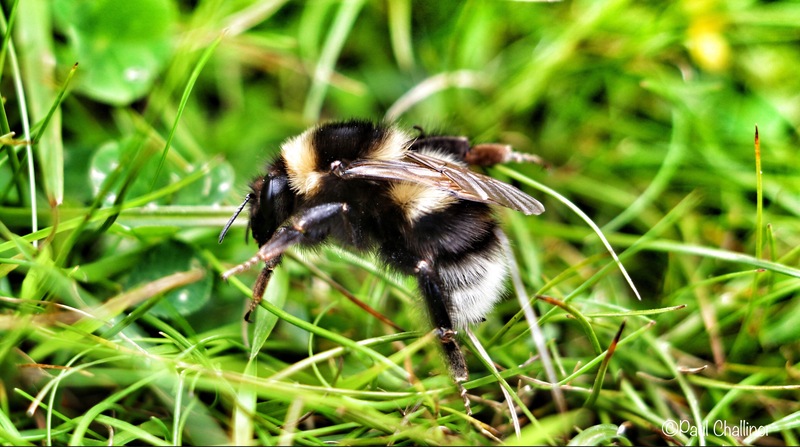 Garden Bumblebee, Bombus hortorum. Not only found in gardens, but I suppose it depends upon your definition of a garden. The National Trust took over the management of the Glyderau and the Carneddau in 1951 in lieu of death duties on the Penrhyn Estate. The total area is about 7,000 hectares, half of which is common land with registered grazing rights for 45,000 sheep and 741 ponies. There are eight tenanted farms on the estate and the National Trust is responsible for the maintenance of footpaths and drystone walls, some of which date back many hundreds of years. The time and skill required to build these walls, sometimes straight up the steep slopes amazes me. Llyn Idwal with Tryfan right on the far left of the picture, followed by the peaks of Glyder Fach, Glyder Fawr and Y Garn on the right side. Will we try again, probably, especially if the sun is shining. Then I can tell you all about Adam and Eve on Tryfan. Now there’s a lead in to a squeal.